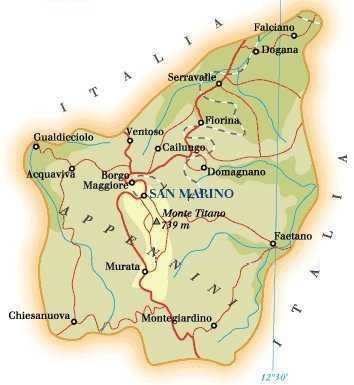 The Most Serene Republic of San Marino or San Marino (Italian: Serenissima Repubblica di San Marino or San Marino) is one of the smallest nations in the world. Located in southern Europe, it is landlocked by Italy, and is one of the European microstates. San Marino claims to be the world's oldest republic still in existence, founded in 301 CE by a skilled builder referred to as St. Marinus. Legally part of the Roman Empire at the time, its foundation does not correspond to its legal existence. Its written constitution was adopted on October 8, 1600. The tiny nation was recognized by Napoleon's France in 1797, and by the other European nations at the 1815 Congress of Vienna. Giuseppe Garibaldi was unifying Italy in the 1860s and took refuge from his enemies in San Marino. There he acquired aid, money, and supplies to continue his campaign for unification from San Marino's citizens and leaders. In return, Garibaldi guaranteed that San Marino would always be an independent sovereign state. Sarolta and I thought we have finished with Italy altogether, when visiting Hungary and Endre, my brother mentioned that he was in San Marino on holiday a few months ago. We travelled all around, including Rimini, but 'clean forgot about' San Marino, so after leaving Hungary, we went straight to visit San Marino. We both enjoyed the tiny little state and the little townships.